Above: GOES-16 image of Tropical Storm Michael at 1:35 pm EDT October 7, 2018. Image credit: Levi Cowan, tropicaltidbits.com. Updated as of 9 pm EDT Sunday: Tropical Storm Michael is headed northward over the warm waters of the Western Caribbean, and is expected to make landfall along the U.S. Gulf Coast between Alabama and the Florida Panhandle on Wednesday, most likely as a Category 2 hurricane. 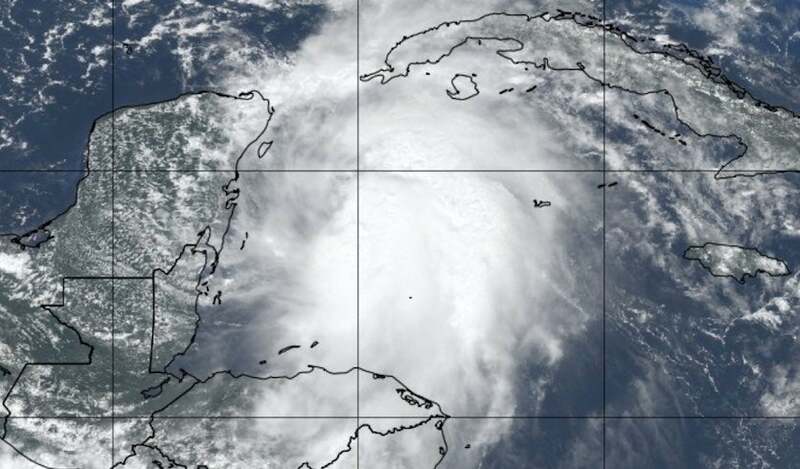 An Air Force hurricane hunter airplane arrived in the storm Sunday afternoon found surface winds of 60 mph and a central pressure of 997 mb by the end of their flight. 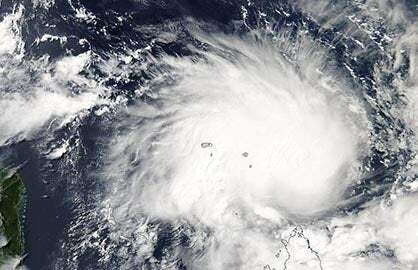 Satellite images on Sunday afternoon showed that Michael was sloppily organized, with an elliptical low-level center of circulation that was partially exposed to view. The system did have an impressive area of very heavy thunderstorms, with cloud tops that were as cold as -80°C. Cloud tops this cold can only occur if the updrafts pushing them upwards are very vigorous. The thunderstorms were not well organized, though, with a clumpy appearance, although more low-level spiral banding was developing. 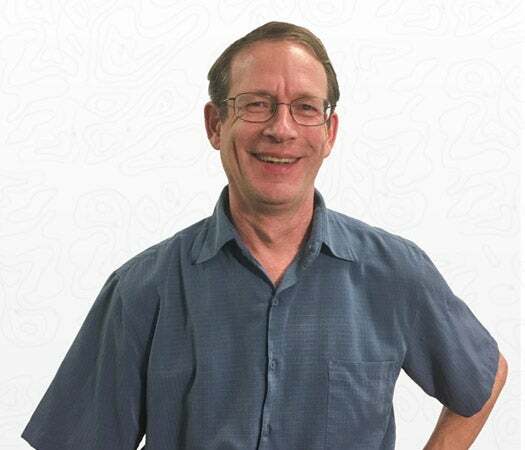 Michael was under a moderately high 20 knots of wind shear, due to strong upper-level winds out of the west from an upper-level trough of low pressure. 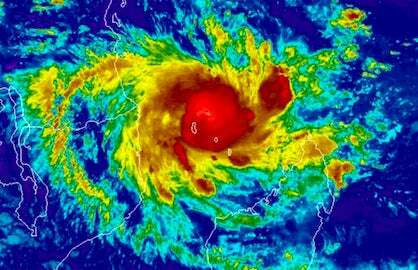 Michael was embedded in a moist atmosphere with a mid-level relative humidity of 70%, and was over very warm waters of 29.5°C (85°F). These warm waters extended quite deep, and had a very high heat content. 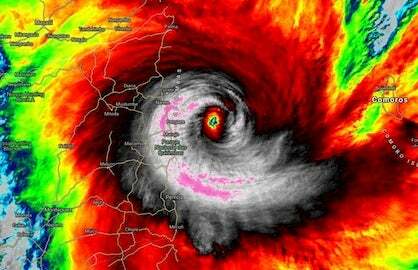 Michael was bringing heavy rains to western Cuba, as seen on Cuban radar. NHC was calling for total rainfall amounts of 3 – 7” over western Cuba, with isolated totals of 12”. Lower rainfall amounts of 2 – 4” were predicted for the Florida Keys and Mexico’s Yucatan Peninsula. Michael is embedded on the north side of a large area of surface low pressure called a Central American Gyre, which is straddling Central America. The counter-clockwise flow of air around this low has brought a moist flow of Pacific air inland over Costa Rica, El Salvador, and Nicaragua, bringing 48-hour rainfall amounts in excess of 10” to portions of those nations. This low will continue to bring heavy rains to portions of the Pacific coasts of El Salvador, Nicaragua, Guatemala, and Honduras through Monday, bringing dangerous flash flooding and mudslides. Over 2700 people were in shelters in Costa Rica due to flooding, and over 1000 in Nicaragua. There is fairly high model consensus on the general track of Michael, but some important details are yet to be resolved. Michael will be shuttled north to northeast between a summerlike ridge of high pressure along the U.S. East Coast and a seasonally strong trough across the West. The flow between the two features is pulling large amount of moisture across the Great Plains, where a corridor of heavy rain will drop 5” – 10” from Texas to Michigan early this week (a rainfall event that may be just as heavy and impactful as the rains from Michael). The eastern ridge will be gradually weakening into midweek as the western trough moves into the heart of the country. Together, these features will pull Michael northward, then northeastward. With this steering, Michael will reach the central Gulf Coast by midweek and then head back off the Southeast or mid-Atlantic coast by late week; it’s possible that Michael will drop 1” – 3” of unwanted rain across parts of South and North Carolina that were inundated by Hurricane Florence last month. Similar amounts could fall from the mid-Atlantic toward southern New England, depending on exactly how Michael tracks. —The last several runs of the GFS model (though 12Z Sunday) brought Michael to the western Florida Panhandle coast on Wednesday, across the central Carolinas on Thursday, and off the mid-Atlantic coast by Thursday night. —The experimental FV3-GFS model’s track is similar but a bit further to the northwest. —Sunday's 0Z and 12Z runs of the European model agreed on a western FL landfall, but not until Wednesday night or Thursday morning. The slower Euro solution also takes Michael on a more southerly inland track that would roll along or near the Carolina coast late Thursday into Friday and off the Outer Banks by late Friday. —Sunday’s 0Z and 12Z UKMET tracks were similar to the Euro’s. The 12Z UKMET and Euro model runs were concerning, as they showed the potential for Michael to emerge over water off the coast of South Carolina. Michael thus has the potential to affect a large portion of the coast of South Carolina and North Carolina as a strong tropical storm or Catgeory 1 hurricane. In general, the track solutions for the central Gulf Coast are close enough that they all fall comfortably within the NHC forecast cone, more so than usual for a prediction three days out. Michael’s greatest landfall impacts are likely to be along the Florida Panhandle coast, although residents of the Mississippi and Alabama coasts should remain on guard for now. Timing is a somewhat bigger uncertainty: Michael could make landfall as early as Wednesday morning (as predicted by NHC) or as late as Thursday morning. With this in mind, preparations should be completed on Monday wherever possible. Sea surface temperatures (SSTs) are between 29 - 30°C (84 - 86°F) across the northwest Caribbean and eastern Gulf, which is 1 - 2°C (2 - 4°F) above average for this time of year. Until Monday morning, Michael will be over waters in the Northwest Caribbean. These waters have some of the highest heat content of anywhere in the North Atlantic, since very warm water extends to a great depth. 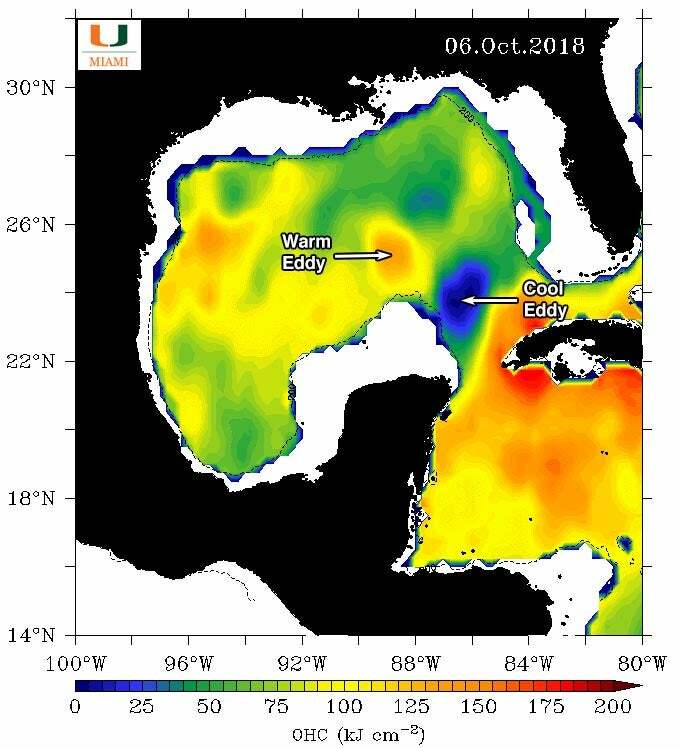 However, Michael is predicted to pass over a cool eddy with low heat content on Monday night after it passes through the Yucatan Channel between Cuba and the Yucatan Peninsula. But on Tuesday, Michael’s center will pass just to the east of a warm Loop Current eddy with high heat content, and if the system is well organized when it passes over the warm eddy, rapid intensification is possible. Even though it is early October, no cold fronts have yet chilled the waters near the central Gulf Coast, so very warm surface waters are in place to support Michael right up to landfall. Bottom line: expect Michael to be a Category 2 hurricane at landfall, with at least a 20% chance of being a Category 3. Figure 2. 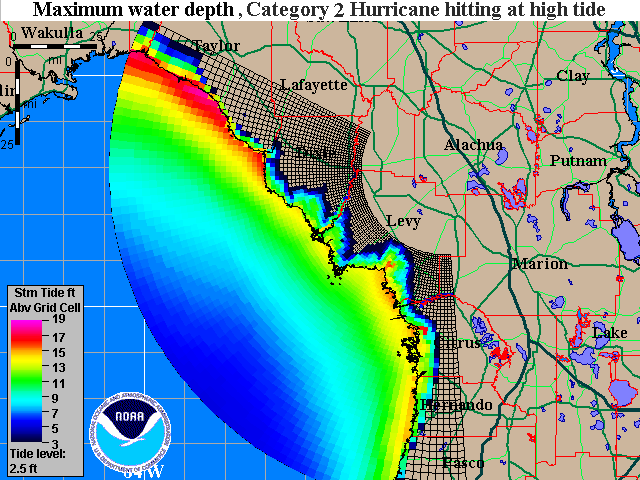 Maximum of the "Maximum Envelope of Waters" (MOM) storm tide images for a composite maximum surge for a large suite of possible mid-strength Category 2 hurricanes (sustained winds of 105 mph) hitting at high tide along the Florida Panhandle. What’s plotted here is the storm tide--the height above ground of the storm surge, plus an additional rise in case the storm hits at high tide. Empty brownish grid cells with no coloration show where no inundation is computed to occur. Inundation of 8 – 19’ can occur in a worst-case scenario along most of the coast. Note that not all sections of the coast will experience this surge level simultaneously; the peak values would occur near and to the right of the storm's center where it makes landfall. These images were created using the National Hurricane Center’s Sea, Lake, and Overland Surge from Hurricanes (SLOSH) model. See our storm surge inundation maps for the U.S. coast for more information. Persistent onshore winds had already created a storm surge of around 1 foot along much of the Gulf Coast from Southeast Louisiana to the Florida Panhandle on Sunday afternoon, as seen using our wundermap with the “Storm Surge” layer turned on. When the center of Michael crosses into the Gulf of Mexico on Monday afternoon, we are likely to see a rise of an additional 0.5 – 1.0 feet, as typically happens when a big storm barges into the large bathtub that we call the Gulf of Mexico. There are very shallow waters along the coast where Michael is expected to make landfall, where the continental shelf extends out about 70 – 90 miles from shore. The winds from the storm will thus be able to pile up a large storm surge along the east side of the storm’s center. When this surge rides ashore at landfall, the water may reach heights of 8 – 19 feet above ground, assuming that Michael will be a Category 2 hurricane with 105 mph winds and hits at high tide. This is a worst-case scenario; a lower storm tide is more likely, particularly if the storm hits at low tide. The 5 pm EDT Sunday official NHC forecast had Michael hitting with winds 5 mph weaker: 100 mph. 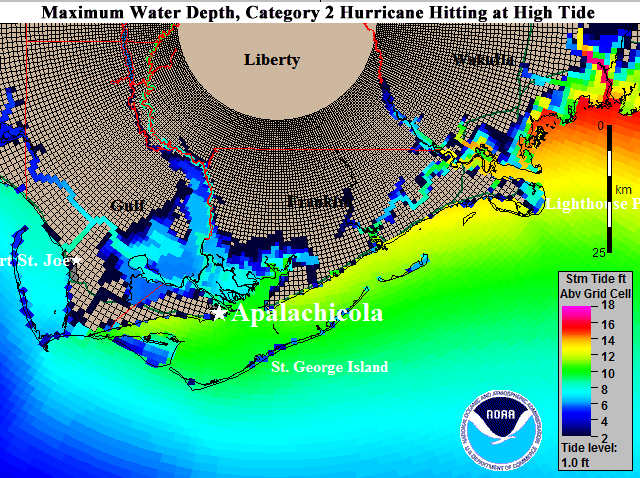 The highest storm surge vulnerability is in Florida’s Apalachee Bay, where the Florida Panhandle joins with the Florida Peninsula, since the concave-shaped coast there acts to concentrate storm surge. High tide is between 12:30 – 1 am on Wednesday and Thursday at Pensacola, FL. There is only one high tide per day in the Gulf, and the difference between high tide and low tide is just over one foot. The high tides in the Gulf this week will not be increased by the fact that the new moon occurs on Monday. This is unlike the situation along the Southeast U.S. coast, where the new moon will bring the king tides—some of the highest tides of the year. Because of the king tides and the onshore flow of air affecting the Southeast U.S. coast from Michael, we are likely to see moderate coastal flooding in Charleston, SC during high tide Monday through Wednesday.